Wabash Valley Prison Break The Wabash Valley 5k Prison Break Run is a 5k obstacle course run designed to be both challenging and fun. No reviews yet for Marshall Illinois Wabash Valley 5K Prison Break 2019. Click here to be the first! 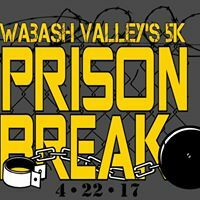 The Wabash Valley 5k Prison Break Run is a 5k obstacle course run designed to be both challenging and fun. This year we will have an elite heat starting at 9:00am for those wishing to compete. Please try to arrive an hour before your heat starts to complete the registration process. All participants must sign a waiver on race day and any participant under 18yr old must have a parent or legal guardian present to sign waiver for them. Please see our obstacle course race discount & promotion page for all the latest discounts, promos, promotions, discount codes, and coupon codes for Marshall Illinois Wabash Valley 5K Prison Break 2019. There also may be one listed at the top of this page.